The Feast of Christ the King is a fairly recent addition to the liturgical calendar. It was instituted by Pope Pius XI in 1925, but the ideas which lie behind it are much older. To stress the idea that Christ is the King of Heaven and Earth is to acknowledge the fact that there is an authority which is higher than any human authority. Christ, as king, unites humanity and points to the Peace of the Kingdom of God rather than the divisions of class and nationalism which lie at the root of the traumatic events of the last one hundred years. This is a great claim to make, and a necessary one for Christians: to acknowledge Christ before all things, even before our family and friends. More than being Welsh, or British, or anything else, we belong to Christ, and acknowledge Him as our Lord and God. Our faith affects who we are and what we do. Nowhere is this more clear than in understanding where our primary allegiance lies. To say that, ‘Jesus is Lord’ is at one level to say that, ‘Caesar is not’. When faced with a religious cult where the Roman Emperor was worshipped as divine, our forebears made a choice. While they would pray for the Emperor as a temporal ruler they would not honour him as a god. They bore witness to their faith at the cost of their lives, because some things are more important, namely our relationship with the God who loves us and saves us. In our readings this morning we hear in the prophecy of Daniel, that God will come to be our judge, and that the Son of Man — who is Jesus — is given dominion, glory, and a kingdom. All peoples, nations, and languages should serve Him, His dominion is everlasting and will not pass away. Christ the Word made Flesh is the fulfilment of Scripture, in Him, prophecy is fulfilled, and made real. We see Christ’s kingship most strikingly in the interaction between Jesus and Pontius Pilate in this morning’s Gospel. Picture the scene: Jesus has been arrested and is being questioned. His disciples have deserted him, and He stands alone in the governor’s palace. Pilate says to Him, ‘You are the King of the Jews?’ Pilate doesn’t understand, it doesn’t make sense. The Jews have handed Jesus over to be crucified under Roman Law, rather than the usual punishment of being stoned as a blasphemer. To claim to be a king is to stand in opposition to the authority of the Emperor, but how does this man do this? He doesn’t look like a king, or act like one. Pilate explains that Jesus has been handed over by the Jews and their chief priests, and asks Him, ‘What have you done?’(18:35) Jesus does not answer, instead He states, ‘My kingship is not of this world; if my kingship were of this world, my servants would fight, that I might not be handed over to the Jews; but my kingship is not from the world.’ (Jn 18:36) Jesus’ kingship is not of this world. Then from where is it? The answer is surely the heavenly realm. Christ is a Divine King, and whereas the emperor may claim to be DIVI FILIVS, son of a god, Jesus Christ is King because He is the Son of God. Jesus goes on to say, ‘For this I was born, and for this I have come into the world, to bear witness to the truth. Every one who is of the truth hears my voice.’ (Jn 18:37) This is what Christ was born to do, to bear witness to the truth. He is ‘the Way, the Truth, and the Life’ (Jn 14:6). In His Passion, Christ bears witness to the truth, namely that, ‘God so loved the world that he gave his only Son, that whoever believes in him should not perish but have eternal life. For God sent the Son into the world, not to condemn the world, but that the world might be saved through him.’ (Jn 3:16-17) This is what real kingship looks like, selfless love and sacrifice. It is not about acquiring and displaying wealth, power, or privilege. To add insult to injury, after Jesus has been flogged, the Roman soldiers put a purple robe on Him and place a crown of thorns on His head, to mock him (Jn 19:2-3) with the trappings of a king. Their mockery is self-defeating, as it proclaims Christ’s kingship. The true King of the Jews is the Suffering Servant, bruised for our iniquities. Christ displays His royal power when he reigns, not on a throne, but from the Cross. God’s kingdom is about healing, forgiveness of sins, and the restoration of humanity, to give us the hope of Heaven. Christ, risen, ascended, and glorified, will come to be our judge. Images of the Risen Christ still bear the marks of nails in His Hands and Feet, and the mark of the spear in His Side, because they are the wounds of LOVE. This is the love God has for each and every one of us. We may not deserve it, we cannot earn it, but God gives it to us, who believe in His Son, Our Saviour Jesus Christ. We are challenged to live lives which proclaim that love to the whole world. Before they were martyred in Mexico and Spain, by regimes opposed to our faith, Christians would cry ‘¡Viva Christo Rey!’ ‘Long live Christ the King!’ just before they faced a firing squad or the hangman’s noose. To acknowledge Christ’s kingship is to do something radical. It is to say to those with worldly power, ‘We acknowledge something greater and more powerful than you!’ It is a radical political act, which terrifies those who are insecure. As Christians we are different. We have built the house of our faith on the rock which is Christ, and not the shifting sands of this world. The world around us may look dangerous and uncertain. Whatever we face, we can be assured of the simple fact that God loves us, and that we are part of a kingdom of love. Let us live this out in our lives, so that others may come to believe and give glory to God the Father, God the Son, and God the Holy Ghost, to whom be ascribed as is most right and just, all might, majesty, glory dominion, and power, now and forever. Amen. In 1925 Pope Pius XI instituted the feast of Christ the Universal King to stress the all-embracing authority of Christ and to lead mankind to seek the Peace of Christ in the Kingdom of Christ. In a time of great misery and inequality: the Church was reminded of what the coming of Christ as Saviour and Judge meant, as well as ending the liturgical year by looking forward to Advent: the season of preparation for our Lord’s coming, in His Incarnation, and as our Judge. A season of reflection, a season of hope, and new life. In today’s Gospel we have the last parable in Matthew which also gives us an apocalyptic vision of Our Lord’s Second Coming. The first thing to notice is that, as befits the Kingdom of God, all people will be there. This is not a Christians-only event. In the Holy Land to this day you will see herds of goats and sheep grazing together and at the end of the day they are separated by a shepherd who can tell the difference between them. Jesus does, however, give his reasons for making his judgement: ‘For I was hungry and you gave me food; I was a stranger and you made me welcome; naked and you clothed me, sick and you visited me, in prison and you came to see me.’ To give food and drink and to make people welcome is fundamental to hospitality and is a sign of Love. Clothing the naked and visiting the sick and imprisoned is likewise showing concern for people, and their needs, showing our love to the world. We believe that God is love and that we are called to show love ourselves in our lives. Our faith, therefore, is not simply private interior devotion, something that we do on Sundays for our benefit, and keep in a box like a Sunday hat. No!It is something we can put into practice in our lives, every day, everywhere. Now in the parable in this morning’s Gospel the virtuous seem rather surprised and ask our lord when they did this to him. Jesus answers, ‘I tell you most solemnly, insofar as you did this to the least of the brothers of mine you did it to me.’ As St Antony, the founder of monastic tradition once said, ‘Our life and death is with our neighbour – if we win our brother we win God; if we cause our neighbour to stumble then we have sinned against Christ.’ So who are the least of Christ’s brethren? Who are the little people? Or to put it another way, who is the most important person in church? Is it Fr Neil? Or is it me? Is it a magistrate? Or a businessman? No … who are the least amongst our communities and who are the least outside them? And what are we doing to help them? Some of the people who would have heard Jesus teaching this parable might well have thought, as Jews, that Israel were the sheep, and the gentiles were the goats, and I wonder whether we don’t all of us feel a little complacent at times. By the same token, the standards Jesus sets in this parable seem almost unattainable so we can feel that we simply cannot live up to them. So we need to be careful that we don’t just despair, that we don’t just give up, and don’t let our discipleship become one of apathy. Our Lord and Saviour Jesus Christ, God himself, became man and lived among us. He showed humility in washing His disciples’ feet at the Last Supper, in eating and drinking with tax-collectors and prostitutes, the social outcasts of His day. He, unlike the society in which he lived, did not judge them. He loved them in order to proclaim in word and deed that the Kingdom of God was for ALL people – the people we might not like, the people we might look down our noses at, and with whom we might not wish to share our table. He gives himself to feed heal and restore them and us. His love and humility are shown in that being condemned to death by those whom he came to save he does not cry out, he does not blame them, but instead asks, ‘Father, forgive them for they know not what they do.’ The Christ who reigns on the tree, and who will come again to judge the world, bears the marks in his hands, feet, and side, because they are the marks of LOVE. They remind us of God’s love for us, and when we eat and drink His Body and Blood at the Eucharist we are healed, and share in His Divine Life, so that we might become the Body of Christ, His Church. Strengthened by this Sacrament of Love we are called to live out our faith in the world around us. While we may not have lived up to the example He sets us, we can nonetheless try to do what we can. In acknowledging the Universal Kingship of Christ we recognise an authority higher than human power, higher than any monarch or dictator, and we are called to conform the world to His just and gentle rule. We are called to transform the world one soul at a time, and through acts of mercy and a life of prayer to make a difference. We may not like the idea of judgement: it is big and scary, and most of us, if we are honest feel that we deserve to be condemned. Now rather than just thinking about judgement as a future event, let’s think about it as a process, something going on here and now. We all live under God’s judgement. Are there things which are hellish in our lives? The problems of cliamte change and how we treat God’s world don’t exactly look great. The way in which we do business with one another, the on-going financial crisis, poverty, hunger and the existence of food-banks show us that all is not well with our country. The wars which our leaders wage against each other seem very far away from the ideal where the lion lies down together with lamb, where swords are beaten into ploughshares and spears into pruning-hooks. For all this we will be called to account, like the servants in last week’s parable of the talents. So what are we to do? First, we are to pray to God that we might have the strength and courage to follow the example of His Son, Jesus Christ. Secondly, we are to remember that God’s love and mercy were poured out on the world at Calvary, and continue to be poured out on us who know His forgiveness. Thirdly, that we are fed and strengthened in the Eucharist so that we may be transformed to go out into the world and be active in God’s service.Finally we are to remember that whatever we do for the least of our brothers and sisters we do for Him. The people or the acts may seem insignificant to us, but not to God. Today the Church celebrates the last Sunday before Advent as the Solemnity of Christ the King, as a feast it is both old and new, while a relatively recent addition to the calendar, what it represents is something ancient and profound: as Christians we recognise the sovereignty of God over the world, and we ask that Christ may rule in our hearts and lives, so that we may live lives of love, so that our faith is proclaimed by word and deed. Before we start Advent, the beginning of the Church’s year, the season of preparation for our yearly remembrance of Our Lord’s birth in Bethlehem; we stop for a moment to ponder Christ’s majesty, His kingship, and what this means for us and for the world. As someone of the House of David, it is good to start by looking back. Just as the Lord said to David ‘You shall be shepherd of my people Israel’ (2Sam 5:2) this also looks forward to Christ who is the the Good Shepherd, the one who lays down His life for His sheep. In him we see the meaning of true kingship, and true sacrifice. In this morning’s epistle, St Paul praises his Lord and Saviour as ‘He is the image of the invisible God, the firstborn of all creation. For by him all things were created, in heaven and on earth, visible and invisible, whether thrones or dominions or rulers or authorities—all things were created through him and for him. And he is before all things, and in him all things hold together. And he is the head of the body, the church. He is the beginning, the firstborn from the dead, that in everything he might be pre-eminent. For in him all the fullness of God was pleased to dwell, and through him to reconcile to himself all things, whether on earth or in heaven, making peace by the blood of his cross.’ (Col. 1: 15–20). It places Christ before and above everything, it sets the scene for our worship of him. Jesus Christ shows the world His kingship when He reigns on the Cross. It bears the title ‘Jesus of Nazareth, King of the Jews’ it proclaims His kingship, but those who are standing by cannot understand – if he is the Messiah, who saved others, why isn’t he saving himself? His kingship is not marked by self-interest, he rules for the sake of others, or as St Paul puts it ‘making peace by the blood of his cross’. Thankfully in Luke’s Gospel the penitent thief can say to him ‘Jesus, remember me when you come into your kingdom’ (Lk 23:42). The thief recognises Jesus’ kingly power, he acknowledges it, and puts himself under it. We need to be like him. We need to acknowledge Christ as our Lord and King; we need to recognise both who he is and what he does. We need to, the whole world needs to, acknowledge that Jesus Christ is Lord to the glory of the Father. 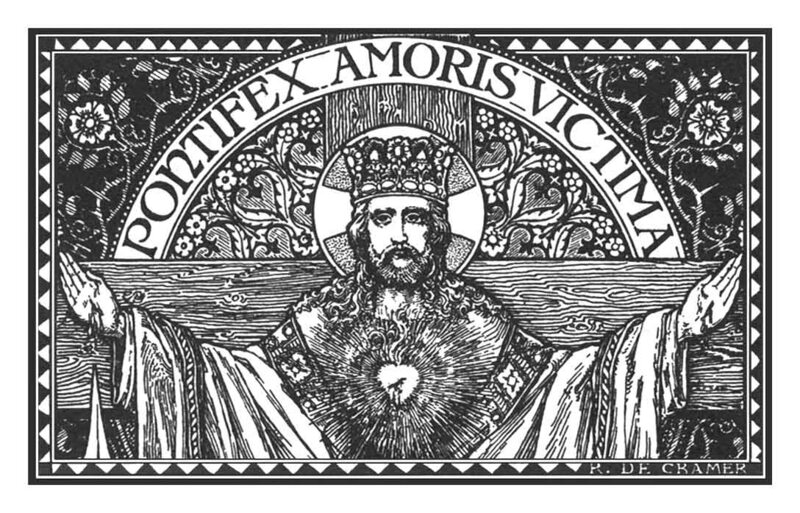 Jesus’ kingship is not the ruthless exercise of power by a dictator; it is rather shown by sacrificial self-giving love, to reconcile God to all things. It is costly, and His Body still bears the wounds of love, which heal our wounds of sin and division. But He is also transfigured and glorious, so that we can have confidence in whom we worship. As He gives himself for us on the Cross, He gives himself to us under the forms of bread and wine; he feeds us with himself, so that our nature may transformed, and we may be given a foretaste of heaven. So let us worship Him, let us adore Him, let us acknowledge His universal kingship, the Lord and Redeemer of all. What looks to the world like defeat is God’s triumph, it opens the gates of heaven, it inaugurates God’s kingdom of peace and love, into which all may enter. So let us enter, and encourage others to do so, so that the world is transformed one soul at a time, let us invite people to enter into the joy of the Lord, that they may believe and to sing the praise of God the Father, God the Son, and God the Holy Spirit, to whom be ascribed as is most right and just all might, majesty, glory, dominion, and power, now and forever.